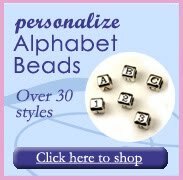 Fabulous bead project ideas that don't take forever to complete. Our favorite styles are the trendy, classic, adventurous, the colorful and sophisticated. Most projects can be completed in 1-2 hours, a short afternoon or evening. 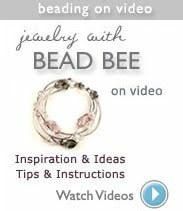 You will also find information about beading techniques and helpful tips. 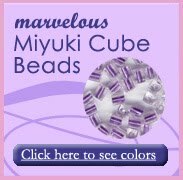 We offer convenient online shopping at www.BeadBee.com. Mixed media is a fun and easy strategy to create interesting jewelry designs. You just need to combine two or more different types of beading material such glass beads, gemstone beads, crystal beads, metal beads or pearl beads. Mixed media is fun because you can mix different materials, shapes and colors and incorporate them into a harmonious design. For example, you can mix strands of pearls, gemstones and Czech glass in different, but complimentary colors. 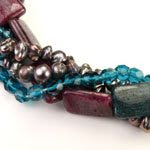 You can also mix beads that are made of different materials but are similar in color for the monochromatic effect. Test out several combinations to help you visualize the perfect match.